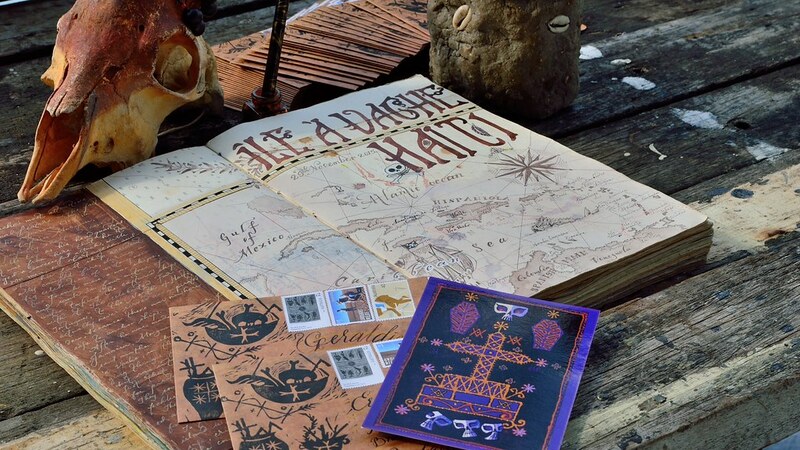 Outgoing mail, in the company of my journal pages from Haiti, the Baron Samedi (His Purple Majesty), a goat’s skull I found on a city sidewalk in Darwin (waaaay more bizarre than if I’d found it in South America somewhere…) and our homemade Elegguá (in some ways, the star of my letter). The letter “Cemetery Story” will no longer be available by end of day (ACST, UTC +9:30) on October 30, so if you enjoy slightly morbid stories about visits to cemeteries, or are famiiar with the Lucumí, Mayombe, or vodoun religions that traveled with the diaspora from Africa to the Americas via the African Trans-Atlantic slave trade, then today is your last chance to sign up to Patreon and receive this issue of The Scarlet Letterbox. The letter is a little longer than usual, but I’m reluctant to amputate any more of it than I already have, so this letter will have an extra page of writing, so I can finish telling the story! The envelope has been printed by hand, using a homemade rubber stamp, in black and gold inks. I’ve also slipped a postcard of my interpretation of Baron Samedi’s vevé, a design particular to Haitian vodoun, into the envelope. On the Patreon site, patrons will have access to my favourite poem on the subject of death…(it’s not what you think—it’s a humorous, wonderful poem that totally celebrates the fact that life and death are yin and yang, each wrapped in the other’s embrace, both natural and desirable) as well as photos of some of the people, places, and things that I mention in my letter. ¿Why can’t I do ‘back issues’, anymore? The thing with Patreon’s set-up is that I can’t charge individual patrons for individual letters. These days, when I publish a “paid post”, all of my patrons get charged at one time, for the same letter. It’s too confusing to charge everyone, but for different letters. When November’s postal train pulls away from the station on the 1st, that’s it; you may sign up for Patreon any time in November, but you’ll be waiting for December’s letter car to pull up. Another letter done. I’m behind on my monthly letters, trying to squeeze them in on the days that I don’t work at the art supplies shop. I have the nicest subscribers, though…nobody has written a snarky e-mail complaining about the late arrival of their letters, yet. Hopefully, when a letter finally does arrive, it proves so special that the recipient forgives me. I do try to make these letters worth the money, and the waiting time. I pour most of my time and thought and material into them, these days. I haven’t even checked my receipts to work out whether I’m actually earning anything (I think I’m scared to find out that I’ve spent more than earned!) but I enjoy the work so much that if the letters simply pay for themselves (the time spent writing and making them, the envelopes, the printing, the little things I include, the postage, the art materials, the books about letter writing that I have been hunting down on the internet and adding to my library) then I am quite content. The way I’ve justified it to myself is: I would be doing something creative like this, anyway; I can’t not draw, paint, design, write. 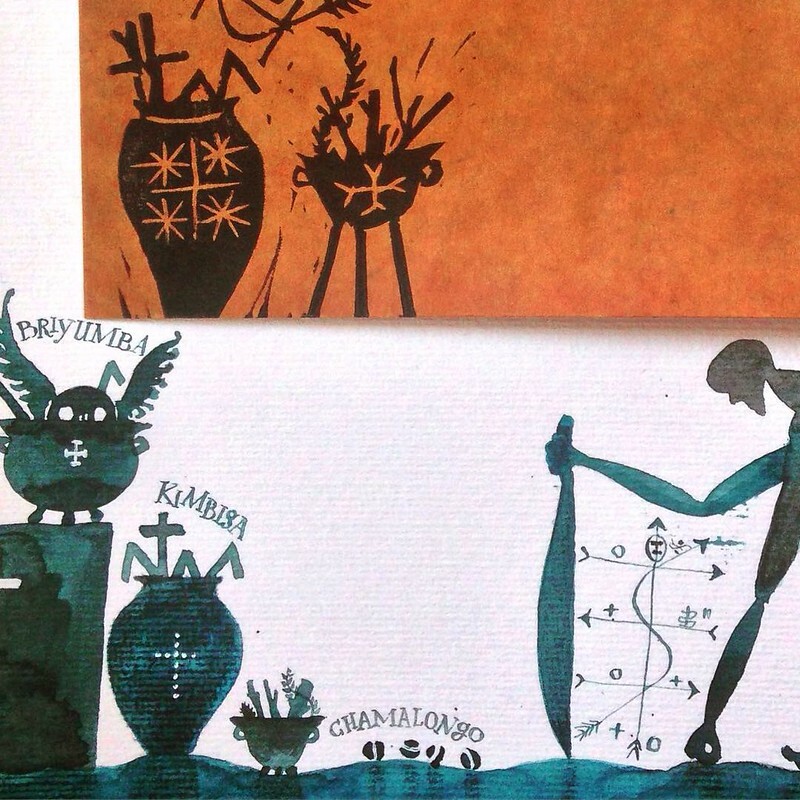 Every new letter, for me, is an opportunity to combine—loosely or inextricably—visual elements and the written word: an idea explored in at least two ways. 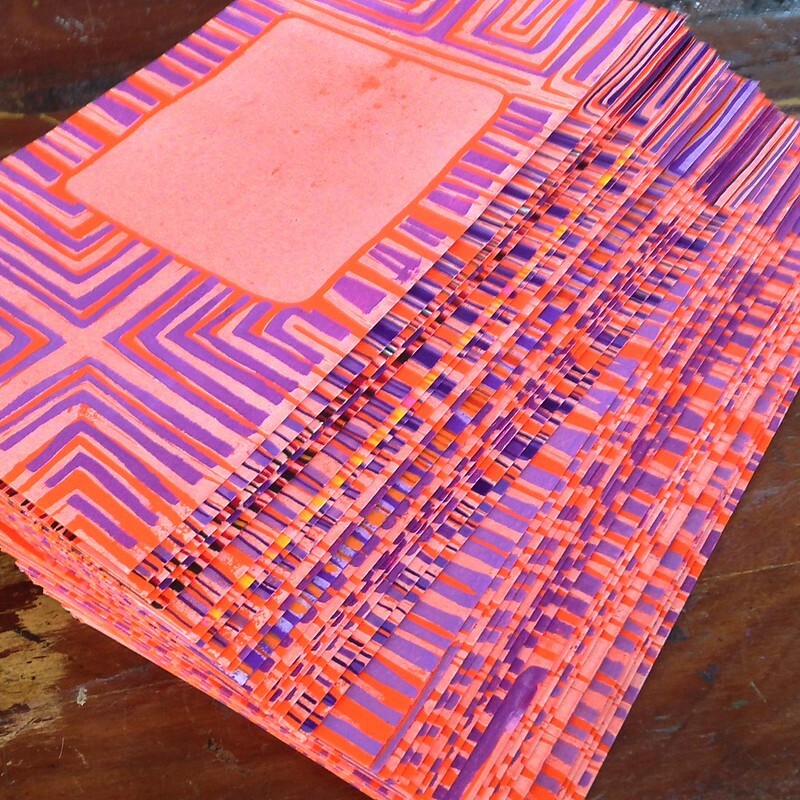 It’s enclosed in an envelope (that can also be a work of art) that bears the recipient’s name and address. Add to this the official postage stamps and cancellation marks of the Post Office—marks of documentation—and the letter is historically positioned, an artifact in Place and in Time. 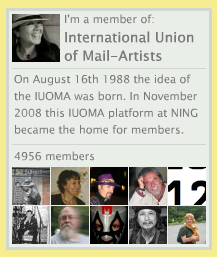 Finally, I love that letter writing also encompasses interaction with others. Each letter is, from the moment of its creation, intended for somebody…it’s delivered by people (I often wonder about the anonymous couriers who deliver my letters) to other people. It’s a message, as well as a work of art, and its audience is woven into its making, from the start. I tend to produce art in a kind of vacuum or cave, filled with echoes of my own voice. I spend four days each week confined to a houseboat in the mangroves, gazing into my head instead of out of it, painting and writing things that I often don’t know what to do with, when they’re done. Naturally, I hope that each work will find its way out into the world, though a lot of them never do…they wind up wrapped in tissue at the bottom of a cardboard box. Since I started making these letters, though, others figure much more in what I do. I write and paint with specific people in mind…knowing, even as I work alone, that the thing I am making is awaited, expected, and appreciated. AND it never gets boring! Which is MAGIC! Possibly the best thing about the whole project! Every month is an opportunity to try something new, to experiment with all these elements, to take them apart and recombine them without worrying that I’m producing a dog’s breakfast of crazy, disparate works, because the letter’s very distinct form pulls them all into a coherent whole. It really is the perfect medium. I’ve found my “Next thing”! I can’t get over it. I can’t believe it took me so long to recognise this. The Scarlet Letterbox is my mail subscription project. 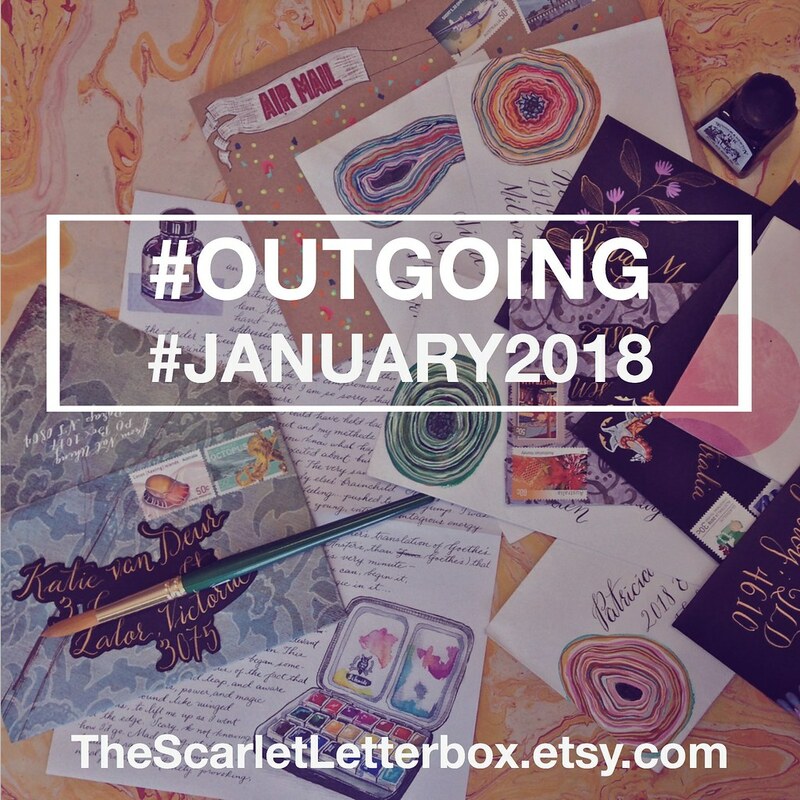 Receive beautiful letters of art and writing, in envelopes decorated with calligraphy, vintage postage stamps, wax seals and illustration, once a month, for up to 12 months. CLICK HERE for more information. Having so much fun with the February letter. 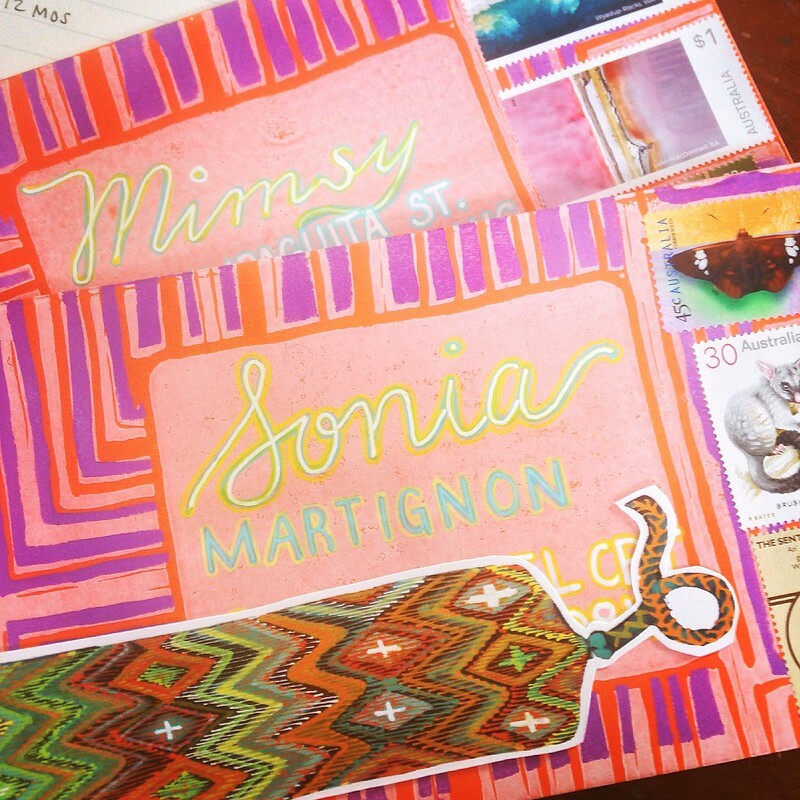 Now that my initial anxiety is gone (thanks to such a great response from the first recipients of the January letter) I have been able to muse on the idea of Mail—its symbols, its purposes, its paraphernalia—more, and get creative and playful with my letters. I started by making a mini-sheet of Artistamps. 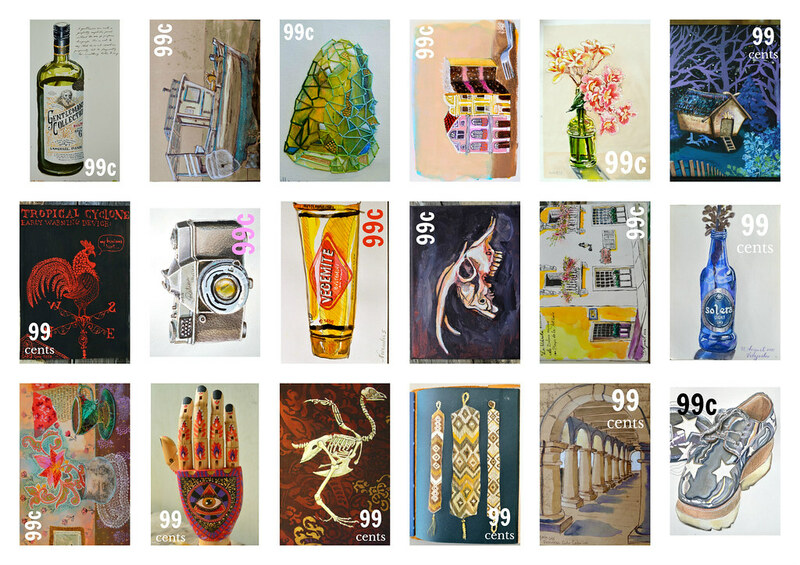 Irony, satire, humor, eroticism and subversion of governmental authority are frequent characteristics of artistamps. 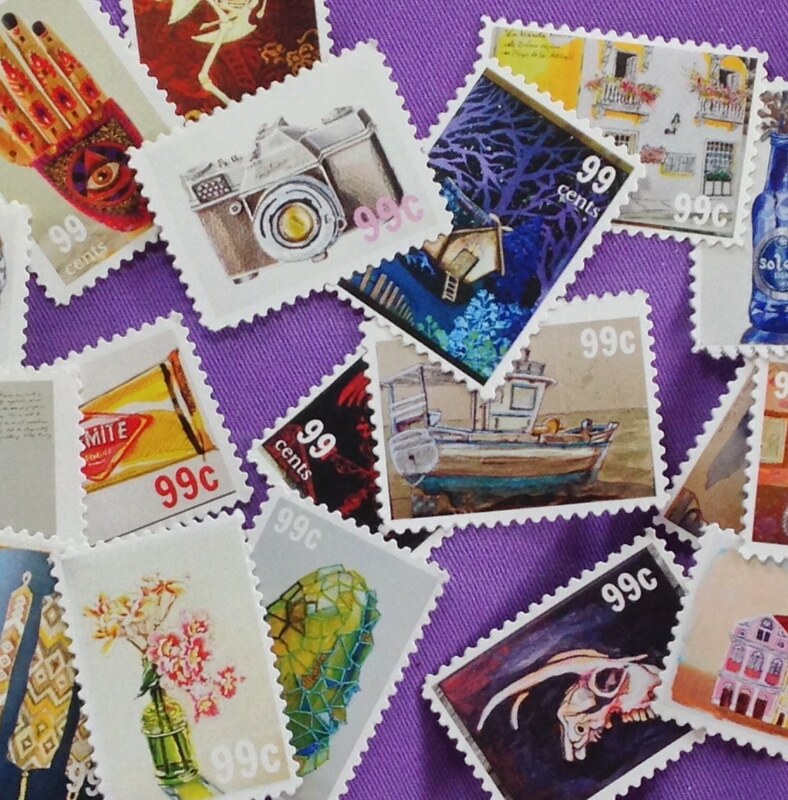 Artists play with the expectation of official endorsement that the postage stamp format inheres in order to surprise, shock, or subvert, the complacent viewer’s presumptions. The fact that the artist’s stamp sets its own stamp on an (art) letter is one of the special features of this form of expression. A further facet of this small-format art is its challenging the mail monopoly by laying claim to the perforated and gummed miniature works of art. The stamps the artists create are not meant to swindle the postal service, but to call into question the right to design things. The designs will be familiar to most of you; they have been taken from scans or photographs of my sketchbooks and paintings. There are 18 different designs on each sheet, and everyone who receives the February letter will get a complete set. The hardest part of making these stamps was deciding which 18 images to use! 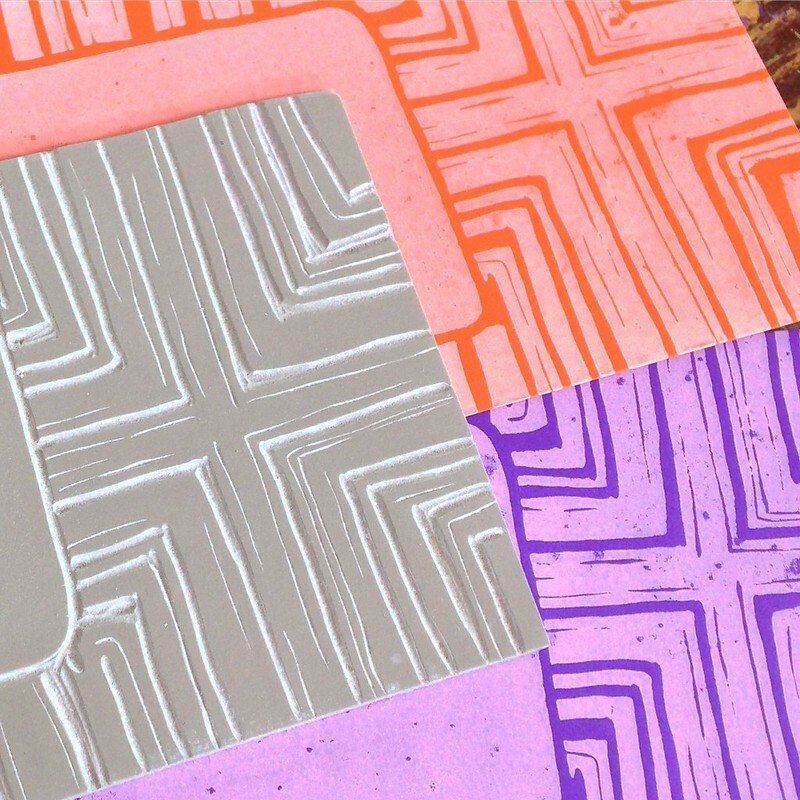 It was so much fun, and the finished stamps are so endearing, that I know I’m going to have to design several sheets more, over time, just because I want to see what everything I have ever made looks like as a stamp! The phrase, “the right to design things,” in The New Museum Weserburg’s exhibiton description, resonates with something I feel about postage stamps. When I looked into the stamps currently available from Australia Post’s philatelic shop, I found only half of the available designs were stamps that I would care to put on my letters. Among the reasonably nice flowers, landscapes, Aboriginal art, and animals (especially the gold-foiled Chinese New Year horoscope sheet), were sets like: Legends of Television Entertainment, Convict Past, and Norfolk Island Convict Heritage (two distinct sheets sporting drab paintings of historic prison buildings), the black and white set of Women in War, a banal collection of Love to Celebrate stamps (roses love-heart, pair of wine glasses, pair of wedding rings, cake, balloons, etcetera) and a couple of small, brown, dull Christmas Island Early Voyages stamps. An announcement heralds the imminent release of the depressing Norfolk Island Golf stamp set, featuring a man rolling his golf clubs across the green. 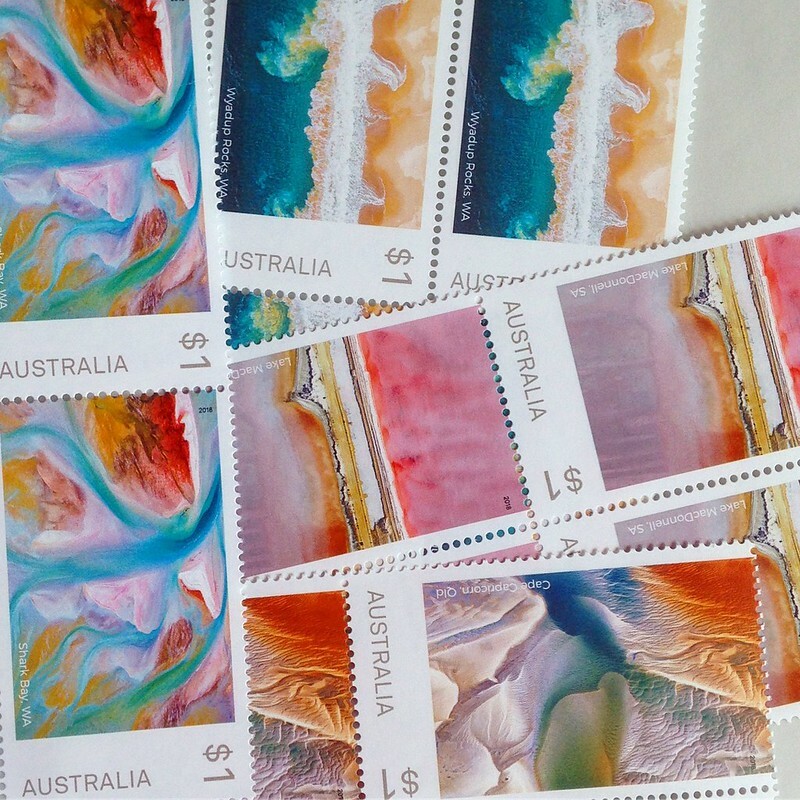 I don’t understand why such a poverty of beautiful stamps exists in my country…it seems almost as though AusPost doesn’t hire artists to design their stamps, at all, but hands the task out to retired accountants and ossified history professors. How I envy people in the U.S. their ability to order customised stamps from Zazzle.com, with anything they want, printed on them! So lucky…. Until Australia catches up with the world, I guess I’ll carry on making artistamps. I messed up the first sheet by trying to perforate the stamps with my sewing machine. Without power on the boat, this meant turning the wheel with one hand while guiding the sheet with the other. It took nearly an hour to perforate one sheet, so I gave up on that idea. Instead, I used a pair of craft scissors with a fine wavy pattern to cut the stamps apart. Quicker and much nicer looking. I’ll be sending a complete set to each of my letter subscribers. They’re in a miniature envelope, with an extra artistamp affixed, and my friends at the local post office lent me their cancellation stamp—whee!—so I have franked each stamp with an official ring. I love playing with the Post Office’s toys! What to do with these (or any other) artistamps? 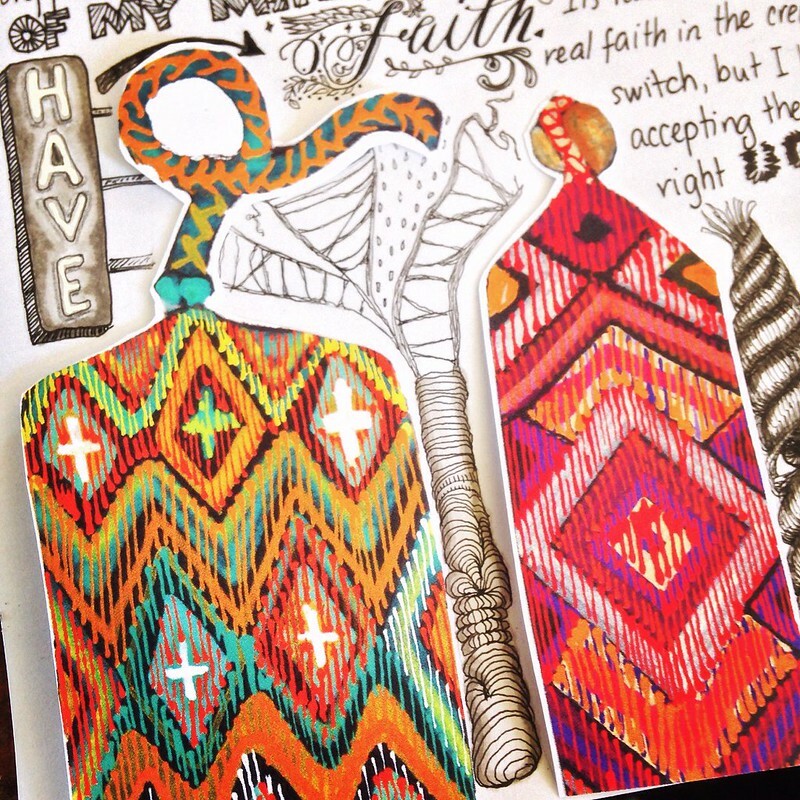 Have a play in your journal, use them in collage, decorate letters you’re writing, or in scrapbooking projects, whatever. 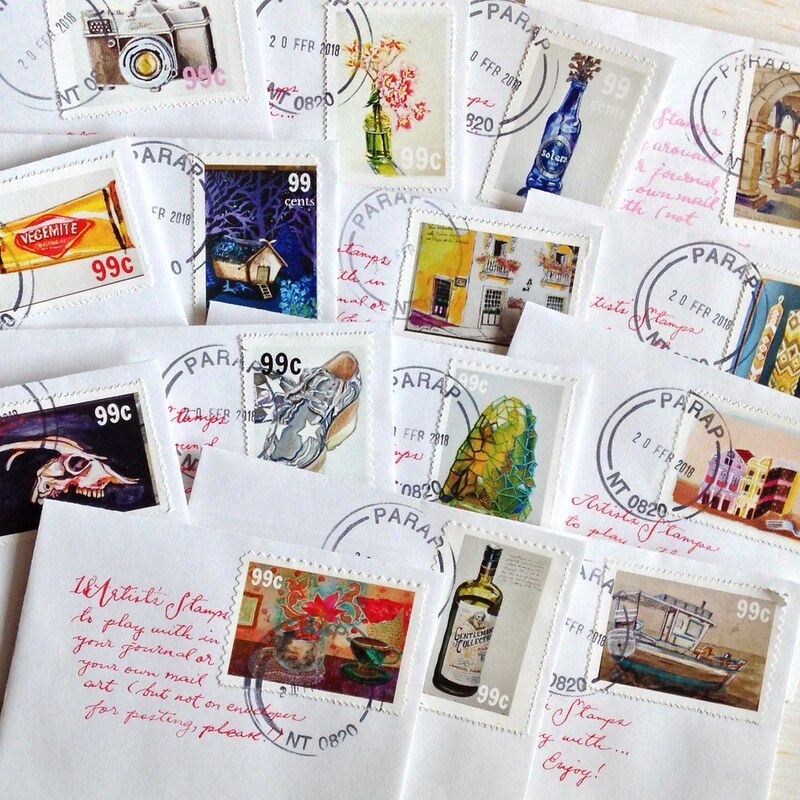 Can you use them, mixed in among the real postage stamps, on an envelope? I don’t know if the stamps I’ve made here are safe to use in the post. I probably shouldn’t have put a monetary value on the stamp, even though it should be obvious that there are no 99c stamps, and they don’t even say which country they’re from. I’m going to ask the Post Office about Australia’s laws on this, and hopefully they will actually have someone who knows the answer! Queries like this are probably exceedingly rare, these days, and I worry that it’ll be hard to find a government employee who knows or cares about these finer points of the law. Always ask about your country’s laws before using artiststamps or Cinderella stamps, as decorative elements, on envelopes going through the actual post…being wrong could turn out to be a federal offense! 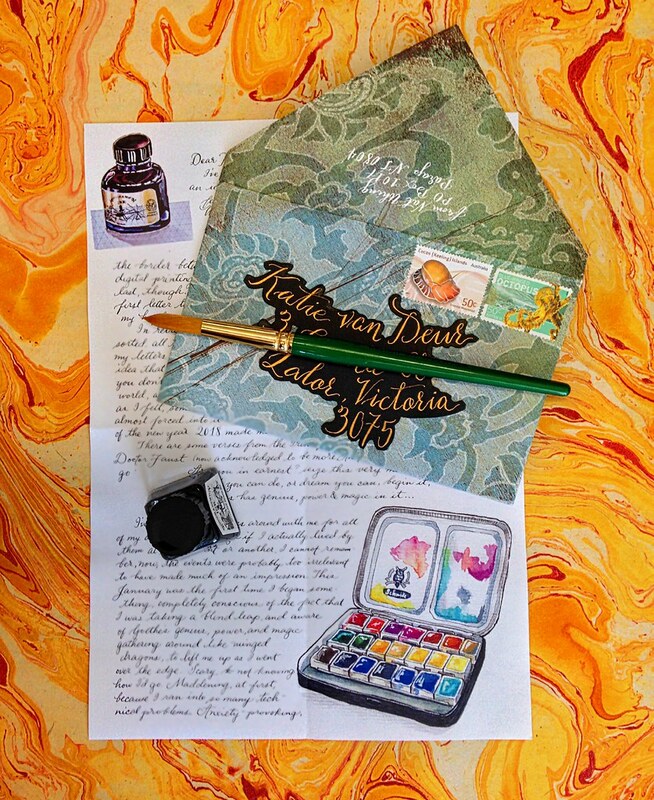 In case you haven’t already heard, every month I write, and then reproduce, a beautiful art letter—calligraphy, illustrations, postage stamps, wax seals, fun inclusions like artistamps or poems or photos, and so forth—and send it out as part of a letter subscription. 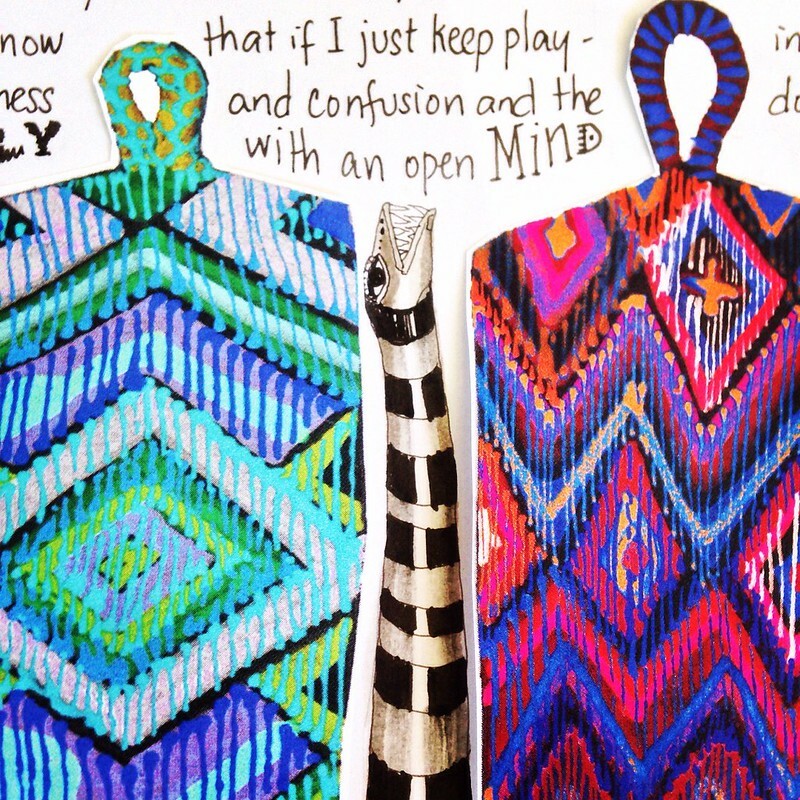 Find a stunning work of letter art in your mailbox…once a month, for a few months up to an entire year. Click here to learn more & subscribe. Very late, but a stack of envelopes with the first letter finally went out (causing a happy commotion at the post office) this Monday morning. The artwork is a bit conservative. I found it hard to begin without knowing how the printing process would treat it. 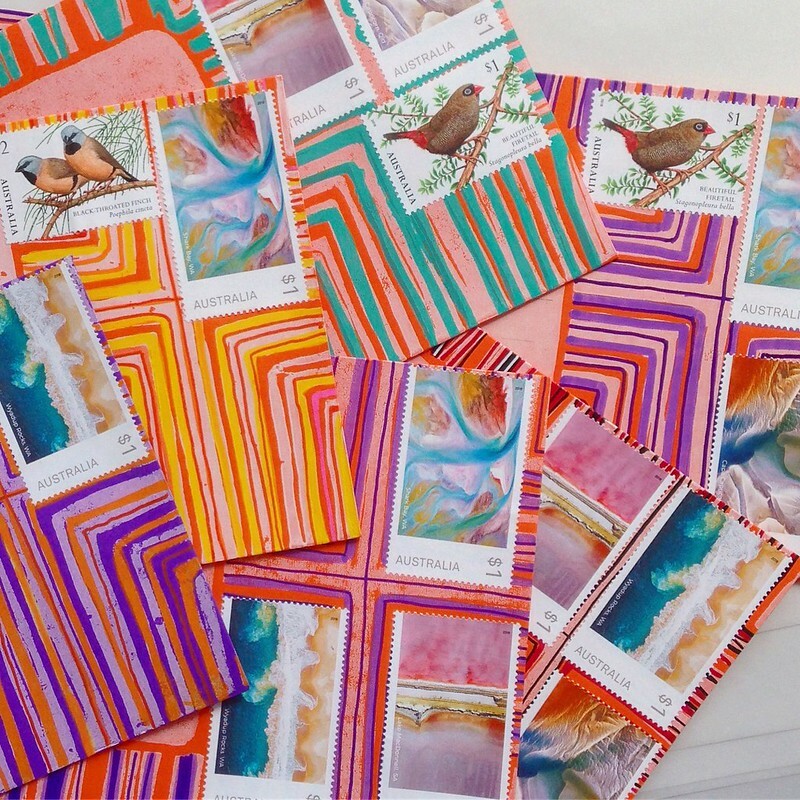 Naturally, I wondered (that is, I stressed) about each reader’s tastes, the reasons they might have subscribed to my monthly letters, and how to make a letter that would, somehow, please them all. Now that I’ve found a good printer in Sydney, I can let myself go on the visuals. Once I start getting feedback about the first letter, I think I will have a better idea about handling the rest. 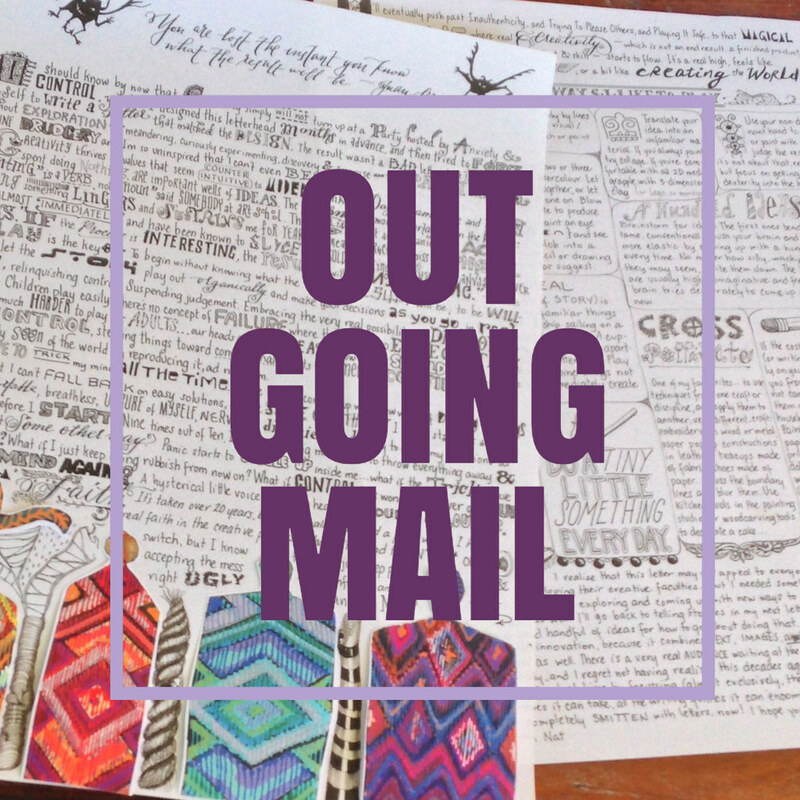 Jill and Kath—letter-buyers and friends I’ve made on this blog, though we have never met in person— both wrote to reassure and remind me to just breathe and be myself. Thank you, ladies…I needed that! Subscribe to a few months—or a whole year—of beautiful monthly letters, and brighten up your usual letterbox fare: The Scarlet Letterbox.